You are the Beloved: Daily Meditations for Spiritual Living by Henri Nouwen compiled and edited by Gabrielle Earnshaw. Since I was looking for a new devotional for the new year, and since I knew I was heading to the abbey for my silent retreat, I ordered the book on Amazon. It’s a great daily devotional with passages from many of Nouwen’s books. While at the Abbey, God used this new book to open an old book for me in a powerful new way. in Life of the Beloved. I was already processing how much time I spend comparing myself and criticizing myself and this quote leaped off the page! 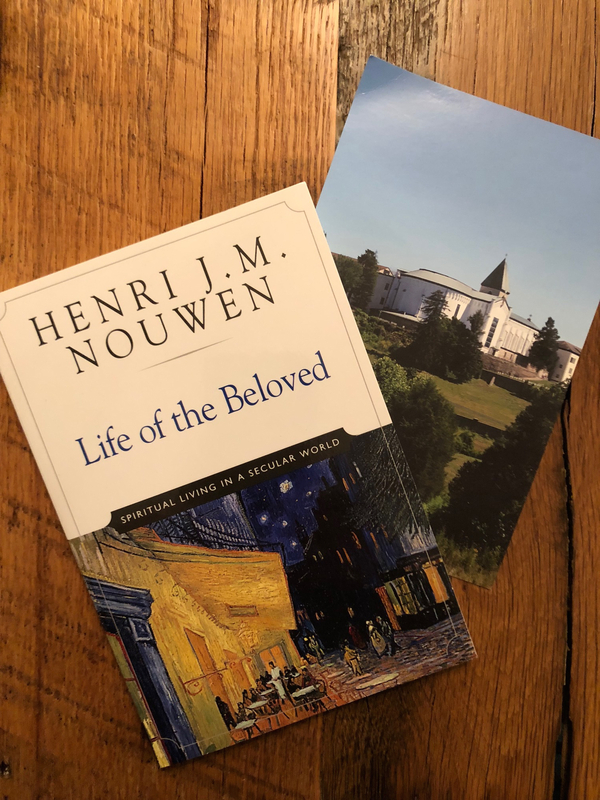 I went down to the the Abbey library, that still has a wonderful card catalogue, the kind with real cards, and found Nouwen’s book Life of the Beloved. It is the book that is impacting me the most as I begin 2019. If you’ve read it before, I encourage you to read it again, and if you’ve never read it, pick it up! There is so much in those short chapters that changed my heart during the course of my week at the abbey and in the days since I’ve been back home. But I’m noticing just how hard it is to stay in the BELOVED zone. 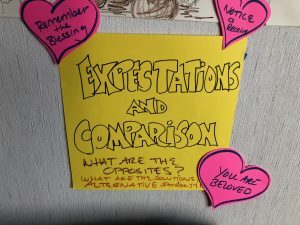 I’m finding that is very easy for me to go from “I am the Beloved of God” to “I’m no good, I’m behind, I’m not doing enough, those people or that person is doing so much more or so much better than I am”…..The Comparison and Criticism Trap! So how do we put living as the BELOVED into Practice? How do we really live into, and as, the BELOVED? I asked myself what makes me feel loved? What does it take for me, for my heart, to actually receive LOVE? What does it take for me to actually believe that I am the BELOVED of God? I’ve also put out visual reminders to help me remember that I am BELOVED! I have a GIFT BAG by my sink that i got at the dollar store. I AM THE BELOVED on the other, so everyone can read it depending upon which side of the kitchen island they are on! It’s a great visual reminder while i’m dong in dishes. I am using my LOVE MUG again. I think I’ve talked about this before. I found a couple of mugs during Valentine’s last year that have the word “LOVE” on them. I use them for my morning coffee to drink in the LOVE of God each day! And since Valentine’s Day is coming up, it should be easy to find a mug at your local shop, even the dollar store has them! I also put up a heart on my bathroom mirror to remind me when I’m brushing my teeth! 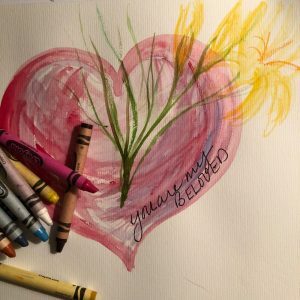 WHAT VISUAL REMINDERS will Help you remember that you are BELOVED? In his book, Henri Nouwen suggests to his friend that he take 30 minutes a day to practice being in God’s love. To take half an hour sitting with God, BEING THE BELOVED! That’s hard. I’m working on Practicing this for 15 minutes a day. Sometimes even 15 minutes is hard if my brain is filled with TO DO lists a mile long! Today, I lit a candle to help me focus. I set a timer on my phone for 15 minutes. I put a gift box on the table in front of me to visually remind me that I am a gift and that God’s love is a gift to me! I sat with my hands open to receive the love of Jesus and asked Him to flood me with His love! WHAT else would help you receive the GIFT OF BELOVEDNESS? One year a friend gave me some wonderful hand lotion that I used during my annual silent retreat. That year was very emotional and God did a lot of inner healing work. That smell still reminds me of that heating time. Is there a scent that brings you healing? A scent that might connect you with being loved or feeling loved? 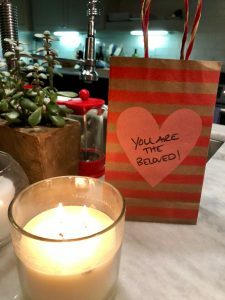 Find a candle or an oil or lotion to use to remind you that you are the BELOVED. Or perhaps it’s tactile. What about a Blanket or a big sweater (jumper)? Using a blanket to wrap around my shoulders as I stop and pray and pause to receive the love of God. The physical touch of the blanket or sweater to give the physical touch of God’s love. What about creating something in art or poetry? or planting bulbs and watching them bloom? I want more and more to live as the BELOVED. I want to grow in this love so I can love others rather than compare myself with them. Nouwen says that rejection, comparison and competition are not telling us the truth about ourselves. the Truth is that we are all children of God. We’re are all God’s BELOVED from eternity and through all eternity….held safe in an everlasting embrace! page 49 Life of the Beloved. Note: As an Amazon Affiliate we receive a small amount for purchases made through the links in this post. Thank you for helping to support the work of Godspace in this way. Join Us for Read the Other Month. Started the book last week. Soaking it all in! And breath out from you to God, “I love you.” One truly feels and believes one Is the Beloved after you repeat this 10-30 times. I go to sleep every night repeating this mantra. It is so gentle and comforting.